If you are a small business owner or a marketing professional, then you know how difficult it can be to drive qualified leads to your website. It can be even harder to increase conversions and boost revenue since small business marketing online can be a confusing matter. There are hundreds and hundreds of ways that you can market your small business. With the ideal mixture of channels and actions, you can recognize and concentrate on the very best advertising and marketing tactics for your company. Here’s a listing of the top 8 small business advertising ideas & strategies to get you thinking about all of the various ways that you can market your organization. One of the worst things that your business can do is to try to sell your product or service to everyone. While it might seem counterintuitive, you are much better off focusing on a particular segment of the population and develop a highly targeted message with great freelance copywriting content that is based on their needs. Since you are working with finite time and resource, you need to ensure that all of your marketing efforts need to drive qualified traffic to your website while boosting conversions and revenue. Your product or service was created with a particular market in mind. You should only sell to this group of people. You will find that you will save lots of time and money, particularly since you integrate PPC marketing and other paid advertising into your marketing mix. All of your marketing materials should drive qualified leads towards becoming paying customers. Whether you are leveraging social media, copywriting, SEO strategies, or PPC marketing, you need to always consider how your marketing is increasing your bottom line. Your sales should be filling up with qualified leads, and your Google Analytics should prove that your message is on point with increasing sales. Think through the type of content you want to use for your Internet marketing strategy based on your customer needs, demographics, and personal. Many businesses seem to fear to talk to their clients, but the truth is that there is no better way to learn what your target audience wants than surveying them along the purchasing journey. You can set up various tools and programs on your website and email to engage with your customers, but the best way to learn about your target audience is to talk to them in-person. You can utilize a number of online marketing tools for small business to help connect with your audience when you need to! This type of customer review process is not scalable, but you can learn a lot about your audience in-person than you can through digital means. Ask about what products and services they have used in the past, if they still use them, why they stopped, and what they like/dislike about your solutions (if they are currently using them). Improve your products and services by integrating this information across all elements of your business and marketing strategy! Your customers are the most important part of your business, and it is surprising how many companies forget to celebrate their customers. If you want to grow your profit margin, then you need always to consider the thoughts and desires of your clients. You can make your customers feel like royalty by offering exclusive deals before their purchase, optimize the purchasing journey as they engage with your brand, and continually communicate with your audience after the acquisition to maintaining a great relationship. As you continually focus on the needs of your customers, your business will begin to develop marketing tactics that are customer-focused, and you will see several long-term benefits. You should understand your opponents’ weaknesses and strengths, whom they’re targeting, and also be in a position to sketch what you believe their approach is. Only then can you suitably create your approach and position yourself to increase your customer based and boost sales. You can approach a competitive analysis in several ways, but start small and then expand as you see fit. You should think about the message that your competition is producing, improvements they are making to their product or services, and the networks/channels they are using to reach their target audience. Record how your competition is building their business so you can find opportunities to improve your marketing and drive qualified leads to your business today! Nothing in marketing or business stays the same for long, so you should always be reading the latest news, tips, and guides on leading websites. If you want to keep growing your business, then you need to know the best ways for you to improve efficiency and increase results no matter what industry or market you serve. You need to read every day. Subscribe to books or blogs. Follow influencers and pros. Have a look at magazines that are applicable. The further you see, the more ideas you receive. Your business has probably created a lot of content over the years, but do you know if it is working? Since you are spending time and resources to make content, you should ensure that you are prioritizing the right content and optimizing each step of the way. Do you or your marketing team struggle to think about the right type of content to make for your business, or do you find yourself playing catch-up and struggle to create great content for specific holidays? Many businesses don’t have a content calendar, and as a result, they are often disorganized when it comes to developing excellent content for their target audience. Not only will an editorial calendar assist you to stay focused throughout this year (and decrease writer’s block), but it’s also ideal for sharing with prospective partners. A content calendar gives you a heads-up view of the year, and you can plan content each quarter, so you don’t have to struggle to produce content while also running your business. 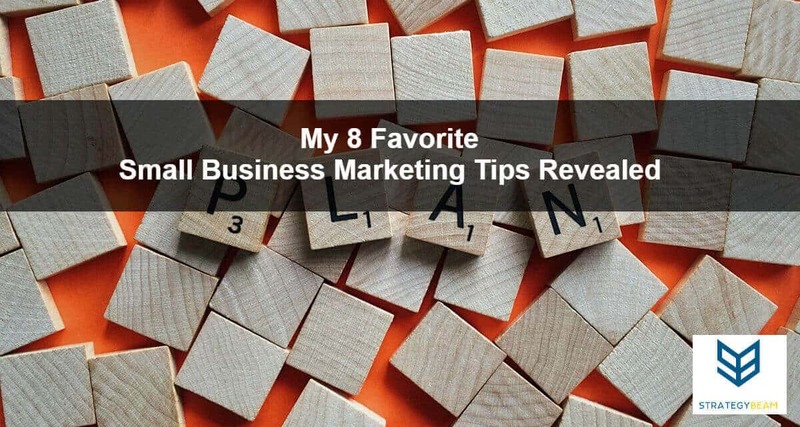 It may appear somewhat overwhelming to feel as if you always have to compete with the “big guys.” The above eight tips can help you identify the best areas to focus your small business Internet marketing time and resources while also improving your marketing strategy to generate more sales no matter what product or service you are selling. As a small company (whether online or local), then you have the chance to construct a reputation of authority and trust with your customers. You can do this by developing a comprehensive Internet marketing strategy based on the needs of your clients and drive the strengths of your business. Running a business can be a lot of work, and many business owners only want someone to help them discover, create, and optimize amazing content around a proven digital marketing strategy. This is why many business owners just like you hire a digital marketing consultant like me to help them out. If you want to learn how I can help you grow your business, then you should shoot me a quick message today! Let’s get started growing your company and increasing your bottom line!